One of the great scientific debates of history has centred around the nature of light. Ancient Greek philosophers were divided as to whether it consisted of a stream of particles or travelled in a manner similar to waves in the ocean. In 1630 Rene Descartes popularised the notion of waves, whilst from 1670 Isaac Newton developed a hypothesis that it traveled essentially as particles. It was Christiaan Huygens, among others, who developed a mathematical model that seemed to prove the wave theory. Further experiments confirmed this theory and so Newton’s ideas fell out of favour. However, by the 1900s things began to change. 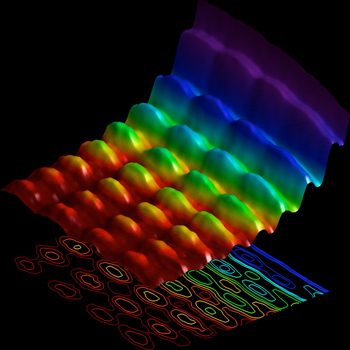 Max Planck and then later Albert Einstein began to study the strange world of quantum physics and discovered something remarkable –under certain circumstances light seemed to act in the manner of particles. Indeed Einstein’s Nobel prize in 1921 was not for his work on Relativity, for which he is most famous today, but for his theories about the nature of light and what later became known as photons. Light, he said, can act as a wave and a particle simultaneously! And whilst there is still some debate over this, many scientists accept this seeming paradox as fact. So what has this got to do with the church? Well I find a remarkable parallel between this scientific conundrum and our approach to theological debates. When we study theology, we are building on ideas first expressed thousands of years ago and which have been revisited many times since. Ideas have been proposed, revised, discarded and resurrected. Often Christians, even learned theologians, see one aspect of a truth and camp there. They reject any arguments that would contradict the conclusion that they have come to even if those arguments are backed by Scripture. Positions tend to become more entrenched as time goes by. Defences are built up against opposing views and proponents of opposing views tend to become more distanced from each other. Eventually these opposing viewpoints become more extreme and they find reasons to reject or even demonise alternative viewpoints. This is a serious problem in the church and it is exacerbated by several factors: in the age of social media such debates often take place over keyboards, they often happen between strangers, there is no accountability, there is no idea of a person’s credibility, and they happen with no guidance by or submission to those who have been tasked with being guardians of sound doctrine – the elders of the local church. Please note that I am not here advocating a compromise on truth. Anything clearly contrary to Scripture must be rejected. We do need to be firm and uncompromising in rejecting heresy and error. However we need to be very careful to reject something as unbiblical just because it seemingly contradicts something we hold dear. The bible is full of paradoxes – seemingly opposing statements. These are often presented without any explanation of how such ideas can be reconciled but which are both true– just like the nature of light! So it is with God – depending on the audience or circumstance we may need to emphasise one aspect or the other to bring balance. But neither side, on its own, no matter how attractive or persuasive to us, fully reveals the nature of the Father and His workings with creation. Like good scientists, we must be prepared to let go of our preconceived ideas and follow the evidence where it leads, no matter how difficult or uncomfortable. In our discussions and disagreements it would help if we act with humility and with a greater desire to reach the truth than to win the argument (even if that means being proved wrong). This article is the first in a series where we will examine some of the paradoxes of Scripture, so look out for more articles exploring this theme. Apologies for any mistakes or omissions made in presenting the scientific details in this article – I confess that after much study of articles trying to explain current quantum theory regarding light I am still as confused as ever! Mike serves in Joshua Generation Church. He loves to see people equipped to effectively serve the Kingdom of God. He is married to Chantal and they have two beautiful daughters. You can follow him on Facebook.